The wooden embers glowed a fiery red as wafts of ash billowed up from a small hole dug in the ground, and with her course indigo stained hands the Zay tribe woman briskly waved the tattered metal pan above the flames flipping and tossing a series of vegetables and mystery meats (the origin of which I could only be left to guess). I looked around curiously at the aging wooden walls and at the small makeshift table on the dirt floor. The "kitchen" as it were was separated from the rest of the shack by a small door which theoretically would keep the smoke out of the dubiously ventilated sleeping quarters where I later slumbered. At length the culinary pyrotechnics had ceased and a delicious dinner was prepared, Zay tribal style. I arrived at the Zay village after the first day hiking. The Zay tribe are one of a variety of isolated ethnic minority tribes situated in the mountains of the Northern Vietnamese highlands. The myriad tribes are as diverse as their traditional headdresses are colorful. 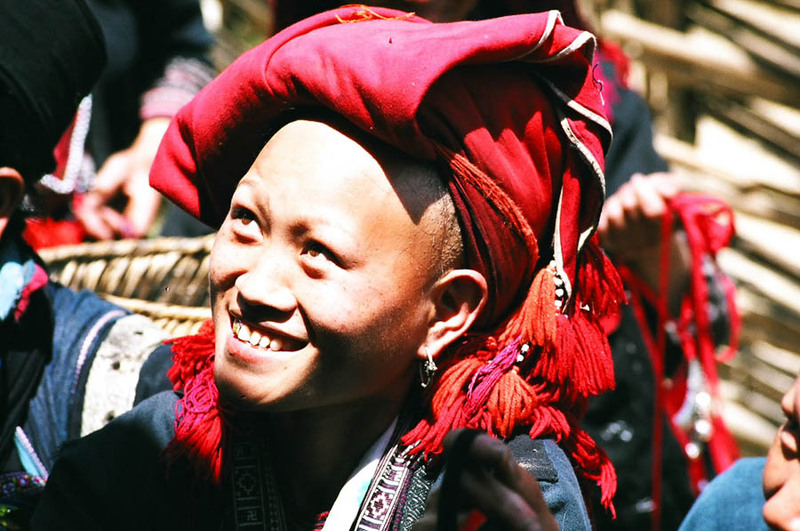 Different tribes have different origins, some are indigenous others descend from ancient migrants from Laos, Cambodia, and Yunnan in Southern China. The Zay have their own language and are about an exotic a people as they come. Dinner was fun and although we didnt share a common language the woman and her family joked with me and laughed harder with every shot of rice wine. Later as I fell asleep under cover of a tattered mosquito net I reflected on how I came to spend the night in a hut in the far off mountains of Northern Vietnam . I retraced my route---Plane from Dallas to LA to Tai Pai to Hanio, over night train from Hanoi to Loa Cai on the Chinese border, then a minibus though serpentine road twisting trough the highlands to the village of Sapa, and then a couple days of absolutely pristine hiking through the mountains by foot. 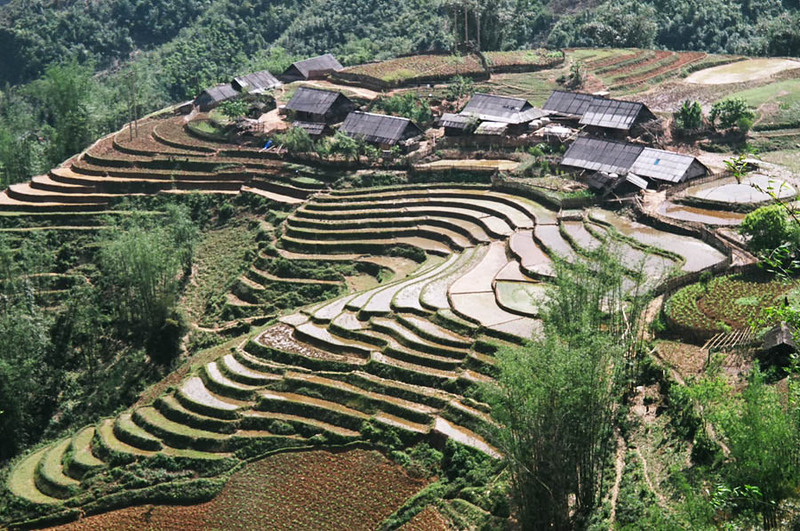 I began my hike from the majestic mountains of the village of Sapa. Up and down sloping mountainsides, past gushing waterfalls, weaving through narrow paths in dense bamboo forests and across expansive valleys with wet mud covered shoes from tramping through muddy terraced rice fields. I passed hulking water buffalo and the occasional mountain farmer. Along the way breathtaking mountainsides with terraced rice paddies gleamed like a series of giant steps carved by innumerable man hours over the eons. The scenery was phenomenal and the temperature was perfect for a trek. The morning after my first day hiking I awoke from the tribal hut and made my way down to a rushing stream through the terraced rice patties to watch the sunrise. The terraces are basically a series of small pools of water stacked above one another. Water trickles down from the mountain tops from terrace to terrace and effectively the terraces constitute a grand series of small trickling waterfalls that eventually empty into a rushing stream. The entire morning valley had an aura of eerie silence save the sonorous melodies of the water slowly cascading down from terrace to terrace to terrace....an extended moment of Zen I guess. Eventually the morning sun rose above the misty horizon and the dawn's first rays of light shone between two large peaks. The next day I trekked to a village of the H'moung tribe. The women there wore dusty tribal frocks dyed dark blue with natural indigo. Brilliant red headdresses with intricately embroidered designs and flying tassels contrasted somewhat with their bare feet and the dark sashes wrapped around their calves. Large silver ornamental earrings hung pensively from large gaping holes in the drooping earlobes of the older women. Their hands glowed a kind of permanent blue from constantly weaving and dying indigo textiles. As I hiked from village to village I found myself being invited into many huts, perhaps I was a greater curiosity to them then they were to me. After a couple days of hiking I began to find my way back to civilization and made my way out of the mountain valley to a muddy unpaved dirt road where I hired a Russian jeep back to the village of Sapa. At one point on the way back the driver was accosted by a local who had apparently asked for a ride. The driver emphatically declined and shoed the would-be hitchhiker away. As we drove off I heard a loud thump on the back of the jeep. Then peering through the small 1 foot by 2 foot window in the back of the jeep there appeared a torso, quite hilarious actually. Here was this guy clinging for life on the back of a bumper the entire way back and all I saw was this torso bouncing up and down in the tiny window, amazing he didn't get flung off as we bumped and slid through cavernous potholes in the mud and over large rocks and other debris. Once back in Sapa I rented a positively vintage Russian made Minsk motorcycle and proceeded to ride my way to the town of Loa Cai on the Chinese border. Suffice it to say the ride through the twisting foggy mountains was no less than spectacular. The path snaked up and down the mountains and occasionally the road emerged from the fog and from high above on the elevated roads the rest of the mountains and valleys were visible poking through the clouds like a series of peaks emerging from a giant blanket of dreamy cotton. The scenery was profoundly moving and on a certain level evoked a measure of introspection and contemplation (I came to the surprising conclusion after a few minutes that I like to travel and that my favorite cereal is Captin Crunch). Every so often I stopped by the edge of the road to snap a few photos. The roadside cliffs dropped precipitously into the valleys far below in some places, interestingly "guard rail" technology has yet arrive in these parts....best to not stray off the roads I guess. Eventually I arrived back in Loa Cai on the Chinese border via a proper avenue lined with hundreds of hammer and sickle flags waving in the breeze. I rode to the town center and then to the border crossing. There sat China just across a large bridge spanning a murky brown river. The Chinese side of the border boasted a massive gate with bright lights and large colorful Chinese letters and looked almost festive compared to the hulking iron gate that stood rusting on the more drab Vietnamese side. Later I hopped on an overnight train and headed to Hanoi. Hoan Kiem lake is small sleepy lake tranquilly nested in the heart of Hanoi. In the early hours of the morning a cool mist envelops the lake and drizzle falls on a small pagoda at its center. The morning dawn draws legions of Hanois citizens both young and old who gather around the sidewalks and parks surrounding the lake perimeter and perform a very peculiar brand of morning calisthenics with such a strange alacrity as to seem almost bordering on pathological. Those not into the trance like calisthenics practice intense Tai Chi. Before the sun even rises loud speakers throughout the city blare socialist propaganda like a rooster crowing at the crack of dawn. Beautifully decadent French colonial building with chipping shades of pale paints add to the cities charm. 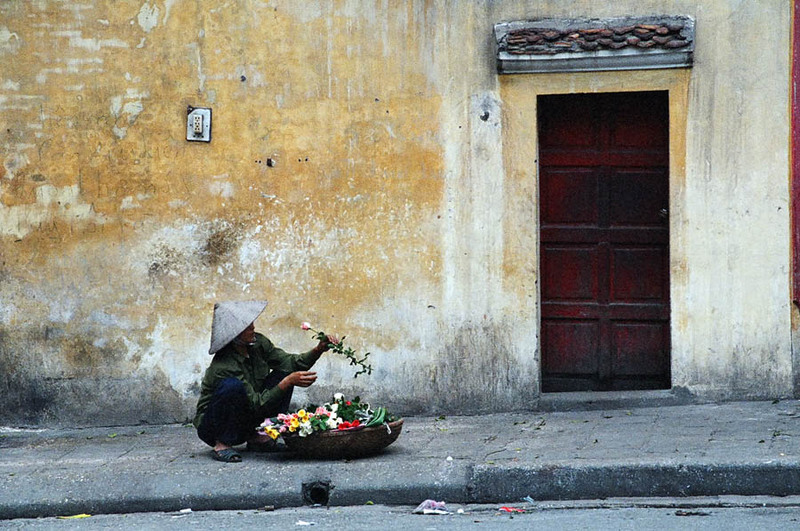 Thus begins another day in Hanoi. Hanoi seems surprisingly intimate for a bustling capital city of 3 million people, 2 million motorcycles, and numerous small lakes. Elderly women wearing conical palm leaf "non la" hats struggle down the avenues selling fruits and vegetables. Most amazing are the heavy loads these hardy women with the slightest of builds tirelessly lug around all day. They somehow sling large pieces of wood over their shoulders with hulking wooden baskets hanging down from both ends. These baskets hold up to 70 pounds as they somehow stoically haul fresh produce from street to street..... and I though my backpack was a little heavy at times. The markets in the city are lively and diverse... shop for flowers, electronics, fish, ice cream, or even live frogs by the basket full. Find your fancy here. Music and movie piracy are rampant and I managed to stuff about 80 CDs and 20 DVDs in a CD case and later on the way out of the country squeaked by customs without so much as a bribe, hard to pass up DVDs for $1 US. No true communist county is complete without the requisite body of a long deceased ideological leader preserved and on display for the masses. China has Mao, Russia has Lenin, and Vietnam has Ho Chi Minh. Uncle Ho as he is affectionately known, lies in a perpetual state of avuncular contemplation inside a heavily guarded mausoleum under dim lights and behind thick plated glass. The macabre corpse looks a little pale and dehydrated, perhaps he coulda used a V8 but otherwise he looks very Ho-like (wispy beard and all). Supposedly under veil of secrecy every year his waxy body is carted off from Hanoi to Russia for a kind of make-over/spa treatment for the dead. Nearby the mausoleum a twisted hulk of tangled metal protrudes out of a shallow lake, one of numerous B2 bombers shot down from the skies during the "American Imperialist War" as they call it. The ubiquitous gold stars on the red flag seem to fly from every street corner shop and countless billboards painted colorful with propaganda are plastered throughout the city. 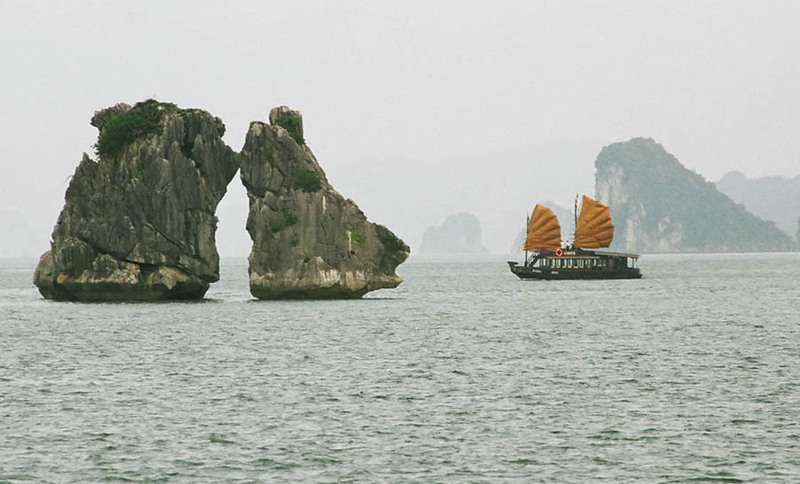 Just off the coast of Northeast Vietnam lies Ha Long Bay. Thousands of tightly clustered small islands comprised of spiraling limestone cliffs dot the bay on the tranquil emerald waters of the Gulf of Tonkin. The best way to get a feel for the bay is by boat as such I boarded a rather larger wooden junk boat and spent the next two days on its bow as the vessel meandered through soaring limestone cliffs seemingly strewn across the expansive bay like giant pebbles tossed into an endless jade puddle. The junk passed floating ramshackle houses that formed small fishing towns and occasionally the boat docked off the islands giving we passengers enough time to go spelunking through a few of the vast limestone caves on various islands. After the first night the boat set anchor in a small horseshoe shaped cove. When I awoke on the boat the next morning the air was absolutely silent, a refreshing serenity that contrasted quite nicely with the noisy chaos of big city life in Hanoi. Back on land a few days later I headed further south and ended up in Hoa Lu the ancient capital of Vietnam, now really just a small hamlet with a few temples and various archeological sites. Close to Hoa Lu is Tam Coc. Tam coc is basically a flat plain with random limestone cliffs sprouting from nowhere. The plain is covered in rice patties and small canals that wind through the flooded rice fields.